Polite friendliness. Polite friendliness is just that; it doesn’t mean interest in being friends or imply any future obligation. An aversion to conflict and confrontation. This goes both ways – Minnesota Nice makes it hard to confront and to be confronted. This can include a strong aversion or unwillingness to give or ask for feedback that might cause friction as well as a pattern of jumping to surface agreement rather than dealing with conflicting and divergent ideas. A tendency toward understatement. This can show up in the workforce as a difficulty to tell others when they have done something well. Emotional restraint. You’ll hear a lot of “not too bad” when you ask how a Minnesotan is doing. Self-deprecation. When asked to explain their own contributions or critique their own performance Minnesotans are more likely to undervalue themselves. Resistance to change. As you have most likely discovered, Minnesotans tend to be born, raised and continue to live in the same town surrounded by the same friends they’ve had since baby play dates and preschool. These tend to be folks who are suspicious of anything different and fearful of a lot of change. Passive aggressiveness. Look for signs like procrastination, sullenness, stubbornness, or confusion and it’s likely you’ve hit on passive aggressive behavior. Of course, not every Minnesotan shares every characteristic of Minnesota Nice, but I’m sure you can recognize some of these behaviors in your Minnesotan-born friends, colleagues, and possibly yourself! Non-Minnesotans often say that it is very difficult to make new friends here because most Minnesotans socialize with friends that they’ve had since preschool. In fact, a few months ago while at Macy’s, I met an African-American makeup artist who said that he had moved here 18 years ago from San Francisco, but his only friends were also transplants. 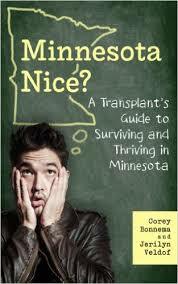 He said it was just too hard to get past “Minnesota Nice” to make good friends. Listening to Corey and Jerilyn, I realized that these behaviors can create unwelcoming campus climates for many people. At the same time, I realized that there are a few things I can do to help new employees feel welcome in my workplace. I can help decode Minnesota Nice behaviors and point them to “8 Tips for Dealing With Your Passive-Aggressive Colleagues, Friends and Neighbors.” Or better yet, I can move beyond polite friendliness and take the time to invite that person to coffee or lunch and really help them feel welcomed. What can you do to combat the effects of Minnesota Nice and make your campus climate or workplace more welcoming? This entry was posted in chief diversity officers, Diversity, Engagement, hiring, inclusion, self awareness and tagged minnesota nice. Bookmark the permalink.